Federal agents are investigating whether an employee was plotting an attack against senior officials of the U.S. Department of Homeland Security inside its headquarters in Washington, D.C., according to federal court filings. The employee, Jonathan Wienke of Martinsburg, West Virginia, was found with a gun by security officers while he was on the job at agency headquarters on Nebraska Avenue in northwest D.C. two weeks ago, according to the court filings obtained by the News-4 I-Team. Wednesday, the U.S. Homeland Security Committee announced it will investigate Wienke and whether the agency responded appropriately. “Initial reports of this incident are very troubling, and my Committee is looking into this serious matter. DHS has been in contact and we will continue to engage with the appropriate officials to gather all the facts,” said Chairman Michael McCaul in a statement. Investigators believe a Department of Homeland Security employee charged with bringing a gun to work may have been plotting an attack. News4's Scott MacFarlane reports. Wienke pleaded not guilty to a gun charge and is awaiting further court proceedings in the case. But Wienke had more than a gun when he was searched on June 9, according to a request for court permission to raid Wienke’s home. A federal agent and security officers also found Wienke had a knife, pepper spray, thermal imaging equipment and radio devices. And the feds said in the court filing that Wienke was found in his workspace, which is in close proximity to a meeting of senior agency officials the day of his arrest -- and that Wienke was aware of the meeting. Wienke’s attorney did immediately return a request for comment. There was no response when News4 knocked at the door of Wienke’s home in Martinsburg, which sits next to the MARC train station near downtown. The Martinsburg Police Department and the U.S. Secret Service have assisted in the investigation, according to a police official who spoke with News4. According to the court filing, Wienke was chosen for a random security screening when he arrived at agency headquarters at 7:30 a.m. 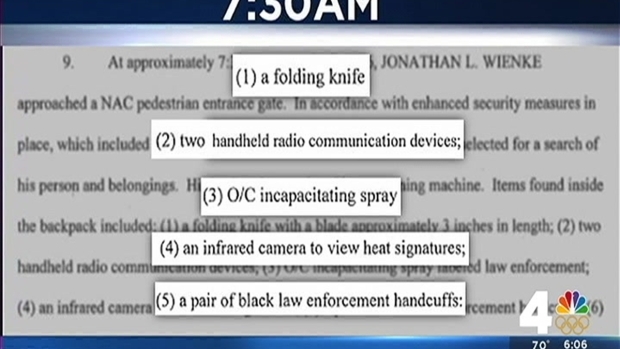 The feds, in their filing, said security officers found the knife, pepper spray, thermal imaging equipment and radio devices during the screening and seized them. But Wienke was allowed to proceed to his office by agency security, according to their court filing. About 90 minutes later, before the meeting of the senior DHS officials near Wienke’s work area, security went to Wienke and asked him to undergo another screening, according to the court filing. During that screening, the feds found the loaded gun and the five hollow-point bullets, the filing said. According to the court record, Wienke had a top-secret clearance inside DHS headquarters, a building which has 3,000 employees. Federal prosecutors declined to comment on the status of the investigatation into Wienke. The U.S. Attorney’s Office for the District of Columbia said Wienke was released from custody on June 13, after a court appearance. His next court appearance is not yet scheduled. 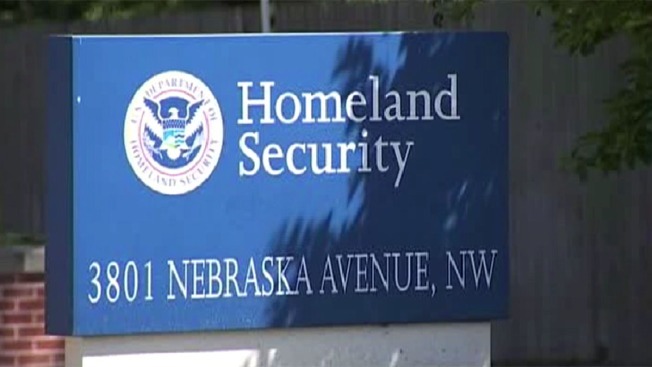 A U.S. Department of Homeland Security spokesman issued a statement: "As previously reported, an individual employed with the Department of Homeland Security (DHS) was arrested Thursday, June 9, 2016 after security officers discovered a concealed handgun. He was detained, turned over to the Metropolitan Police Department and subsequently arrested. The individual, who worked in a non-supervisory role in the Office of Intelligence and Analysis, has been placed on administrative leave." Lester Mehrkam, who owns a book store next to Wienke’s Martinsburg home, said he watched police and federal agents walk around the house earlier this month. “They were casing the outside and knocked on the doors,” Mehrkam said. Wienke commuted to his job in Washington, D.C. from Martinsburg, and was rarely seen outside his house, Mehrkam said.